This survival first aid kit is thoughtfully organized to make finding what you need easier and faster—whether you’re treating a scrape or something more serious. It’s a must-have on camping and boating trips, or any outdoor adventure. Stow it in the car or at home. 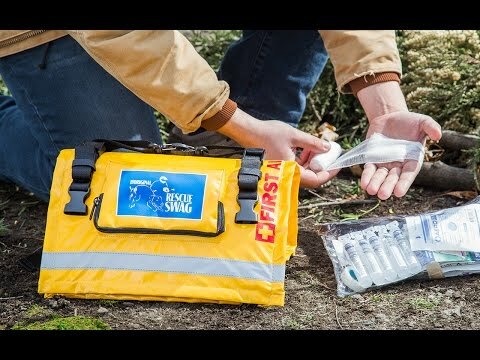 Dimensions: 14" x 8" x 5.5"
Rescue Swag is a survival first aid kit that gives you the gear you’ll need in case of an emergency. It’s lightweight for the amount of supplies, and thoughtfully organized to make finding what you need easier and faster. 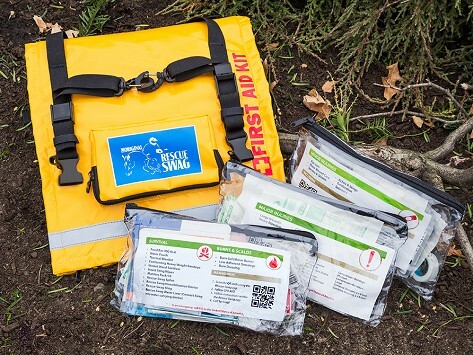 Three removable sections contain the basics for minor incidents, major incidents, and burns & bites—from bandages to an ice pack and safety pins. The case itself is functional, too. It can act as a compression sleeve, sling, splint, or a makeshift water carrier. An accompanying app provides instructional first aid info and pictures. We suggest you review that content ahead of time, though, because a time-sensitive situation doesn’t leave much leeway for research. Created by Tracey Beikoff, an avid equestrian in Australia, Rescue Swag is named for the essential pack itinerant workers used to carry with them. In a similar fashion, this kit gives you the essentials for everyday adventures. Take it on camping or hiking trips. Or stow it in your boat or car for emergencies. This pack even has extra room to add more or different supplies, depending on where you’re headed.